Dal and Rice is the Soup of India. the Traditional Soup of India! 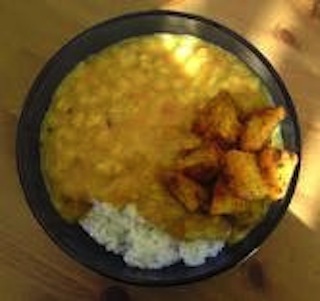 Dal and Rice is a common dish served in India. It's the traditional soup of India, and it's served over, or in combination, with rice. It can be made in a number of different ways. Some people prefer to leave their lentils in chunks, while others prefer to liquify the lentils; do whichever sounds more appealing to you! Some people also put multiple types of lentils in their dal. Bear in mind that spices and ingredients can vary by tradition and custom in the different indian states and union territories because each state may have its own individual cultural aspects that set it apart from another state's culture. The recipe below is one of our favorite ways to enjoy dal and rice! If some ingredients are unfamiliar to you, it's may be because they are more commonly used in Indian dishes. Some of these spices can be difficult to find in non-Indian grocery stores, but don't worry, Indian grocery stores are usually very quite easy to locate, and you probably have one near you! 3/4 cup of Toor Dal (Split yellow lentils); you can really use any lentils you want though! Do you have your ingredients? Good, let's get started! *Preferably use a Pressure Cooker, if you don't have one, you can also use a pot on your stove for the Dal, and simply follow the cooking instructions that come with the rice. 6. Set pressure cooker by filling it with 3 inches of water and a splash of lemon juice (NOTE: If you're not using a pressure cooker, just add a splash of lemon juice to both your rice pan and your dal pan. 7. Lower the rice pan, and then on top of it, lower the dal pan into the pressure cooker and CLOSE THE PRESSURE COOKER TIGHT and set your pressure cooker to high. If you're not using the pressure cooker, then just put both the rice pan and the dal pan on the stove at medium heat, and mostly covered (Make sure to allow a little space for some of the heat to escape or the pans will boil over, be sure and keep an eye on each as they cook). 8. Your pressure should sound (Make a startling whistling sound) 4 to 5 times before the food is cooked. 9. Take the pressure cooker off of the heat so that the steam will de-pressurize. Never attempt to open the pressure cooker right after cooking is complete, just wait a few minutes. 10. Now, open pressure cooker and remove your rice pan and set aside. Dal and Rice is one of the tougher Indian food recipes to make, so if you did it and it taste great the first time, pat yourself on the back! If not, practice makes perfect and this one is worth it. Leave Dal and Rice to the Indian Food Recipes page.